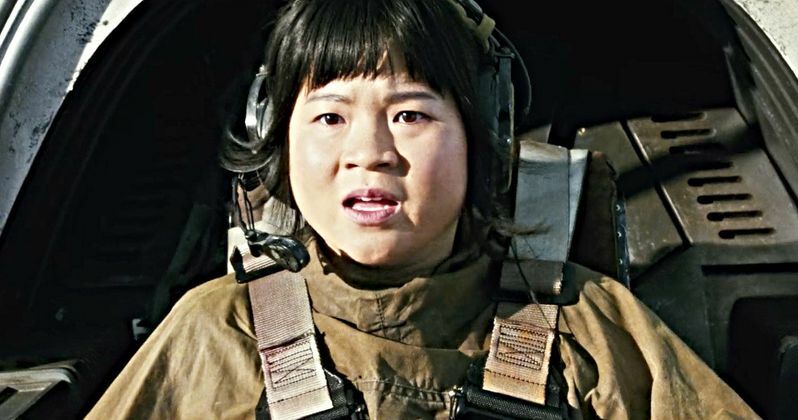 Kelly Marie Tran has broken her silence since deleting her entire Instagram timeline in June. the actress, who plays Rose in the new Star Wars movies, making her debut in last year's divisive The Last Jedi before shooting Star Wars 9 this summer, was subject to constant harassment from internet trolls on social media, which led to her leaving her accounts behind. Now, the actress has returned with a powerful and revealing op-ed. The piece penned by Kelly Marie Tran dives deep into her personal experience as a person of color living in and growing up in America. She discusses how her parents changed their names to fit in better. How she was mistaken for a foreign exchange student when going out to dinner with her white boyfriend's family in her youth. The essay focuses on what Tran has gone through her whole life and how all of the harassment she faced on social media began to reinforce the negativity she's endured. Here's how she began the piece. "It wasn't their words, it's that I started to believe them. Their words seemed to confirm what growing up as a woman and a person of color already taught me: that I belonged in margins and spaces, valid only as a minor character in their lives and stories. Their words reinforced a narrative I had heard my whole life: that I was 'other,' that I didn't belong, that I wasn't good enough, simply because I wasn't like them. And that feeling, I realize now, was, and is, shame, a shame for the things that made me different, a shame for the culture from which I came from. And to me, the most disappointing thing was that I felt it at all." Kelly Marie Tran is not the first person to leave social media over harassment. Her fellow Star Wars co-star Daisy Ridley quit Instagram after she faced backlash for making a post about gun control. SNL cast member Leslie Jones also briefly departed social media at one point after facing copious amounts of abuse. In her piece, Tran discusses the change she wants to see brought forth so that others, famous or not, don't have to face this type of mistreatment in the future. "I want to live in a world where children of color don't spend their entire adolescence wishing to be white. I want to live in a world where women are not subjected to scrutiny for their appearance, or their actions, or their general existence. I want to live in a world where people of all races, religions, socioeconomic classes, sexual orientations, gender identities and abilities are seen as what they have always been: human beings. This is the world I want to live in. And this is the world that I will continue to work toward." Even though she's no longer active on social media, Kelly Marie Tran isn't running scared. The conclusion of her piece makes it crystal clear that it's quite the opposite. The actress is, instead, proud of what she's accomplished and intends to add to that impressive list in the future. "You might know me as Kelly. I am the first woman of color to have a leading role in a 'Star Wars' movie. I am the first Asian woman to appear on the cover of Vanity Fair. My real name is Loan. And I am just getting started." Indeed, we have not seen the last of Loan. The actress is set to reprise her role as Rose in Star Wars 9, which recently began filming at Pinewood Studios in London under the direction of J.J. Abrams. You can read her full op-ed over at The New York Times.